Dutch office MVRDV has revealed plans to build a huge staircase out of scaffolding in Rotterdam, the latest in a series of exciting new additions to the city. Marking 75 years since Rotterdam began its recovery from the second world war, the temporary installation will pay tribute to the architecture that has come about as a result. Measuring 29 metres high and 57 metres long, its will allow visitors to climb up onto the roof of the Groot Handelsgebouw – an office block that was one of the first major buildings to be constructed as part of the post-war rebuild. "The roof of the Groot Handelsgebouw, one of the best buildings of the reconstruction of the Netherlands, deserves to be used as a base for the next intensification of Rotterdam," said MVRDV co-founder Winy Maas. "The Stairs suggest that," he added, revealing the project's name. Today, Rotterdam is a hub for landmark buildings and experimental construction, with new projects including MVRDV's market hall and the OMA-designed De Rotterdam. The Stairs will be built next to another of these new additions – the railway station by Benthem Crouwel, MVSA and West 8. The scaffolding structure will comprise 180 steps, leading visitors up to a temporary observation deck offering views across the city. The roof will also provide a venue for film screening and events, housed within the former 1960s Kriterion cinema. "I used to see Rotterdam from the Kriterion after the films and it gave an fantastic overview of the city," said Maas. 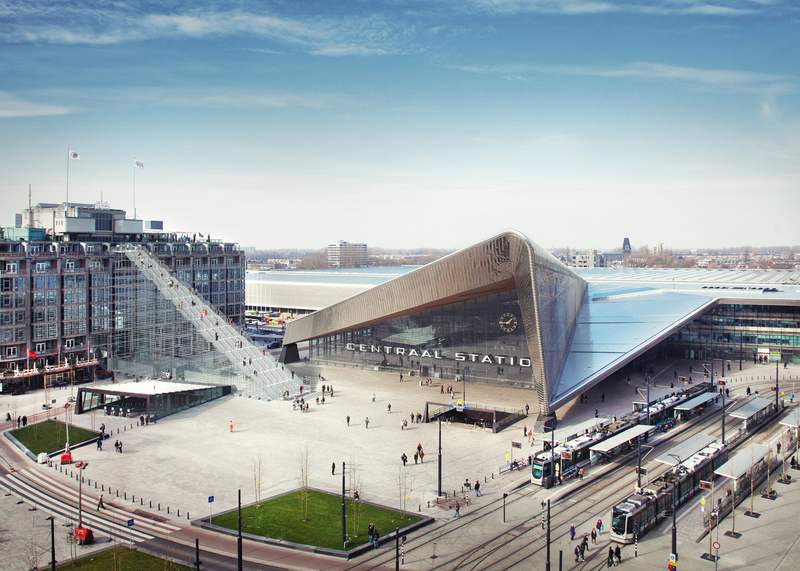 "The Stairs aim to animate the rooftop and to imagine a second layer in the next step of Rotterdam's urban planning, a second reconstruction," he continued. "It would be good to make it a permanent fixture." The installation will be officially opened on 16 May 2016 by Rotterdam mayor Ahmed Aboutaleb, and will remain in place until 12 June. Maas co-founded Rotterdam-based MVRDV in 1993 with Nathalie de Vries and Jacob van Rijs. The firm's completed projects include a library contained within a glass pyramid and a shop and office complex disguised as an old farmhouse. The firm is also working on another project in Rotterdam – a bowl-shaped art depot for the Museum Boijmans Van Beuningen with a mirrored exterior and a rooftop sculpture garden.